On Saturday, Ghana and Rwanda face off in a match that encapsulates the feelings of those who moan about having international breaks so early in the season: it feels like a pointless exercise. This is mostly due to the format the Confederation of African Football have implemented for this qualifying series. It’s basically given the big teams a bye into the next round. Ghana have waltzed through this group-battering Mauritius 7-1 at home in the process. Their last couple of games against Mozambique and Mauritius have been uninspiring to say the least, though. Last time around in Kigali, Rwanda, through good defensive organisation, managed to frustrate Ghana in what was a turgid, unentertaining match on an extremely poor pitch. Ghana’s disjointed possession play was on full display. That was up until the 87th minute when the Black Stars benefitted from Mubarak Wakaso’s brilliant left-footed free-kick. Although the Ohene Djan stadium pitch is no Wembley (or even Hackney Marshes) it should encourage better attacking play. 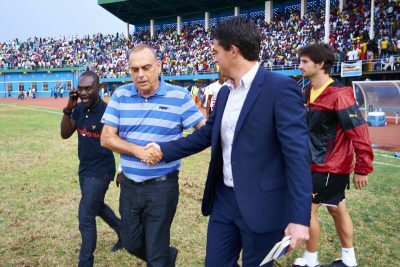 Avram Grant has kept his squads fairly consistent; his original squad only had Ashanti Gold’s Kadri Mohammed as a newcomer. An injury to Jeffrey Schlupp meant FC Twente starlet Yaw Yeboah was called up as a replacement. As sections of the media were already complaining about the lack of locally based players in the side, this added fuel to an already raging fire started by sports minister Nii Lante Vanderpuye, who bizarrely keeps commenting on Grant’s squad selection. Almost by fate, he and many others have had their wish. Transfer window deadline moves involving Christian Atsu, Asamoah Gyan and Jordan Ayew being on the cards, plus an injury to Ebenezer Assifuah, caused Dauda Mohammed, Abednego Tetteh and Emmanuel Ocran to be called up. As this is a match without consequence, It’ll be interesting to see if many local and fringe players will suit up at the start of the game in Accra, or will instead be used in the friendly against Russia three days later. At least one Ghana Premier League forward should start up front as there are no recognised foreign-based forwards and Majeed Waris has been snubbed by Grant. Rwanda have taken the strange decision to sack Johnny McKinstry , who appears to have been trying to build long-standing footballing infrastructure in Rwanda. Speaking to the BBC, McKinstry voiced his bemusement with the decision. “The specific reasons behind the decision have not been made fully clear to me given our performance to date, I am therefore both surprised and disappointed by the announcement today, and that myself and the team will not be able to finish what we started”. Caretaker coach, Jimmy Mulisa, has been ruing his players’ poor fitness, which doesn’t bode well for 90 minutes of running side to side in your own half. “So far the training is going on pretty well but the main focus right now is to increase the intensity and physical fitness, the level of fitness is low among the players and that is why we are doing three sessions a day in order to try to get the desired (fitness) levels as soon as possible,” Mulisa said.